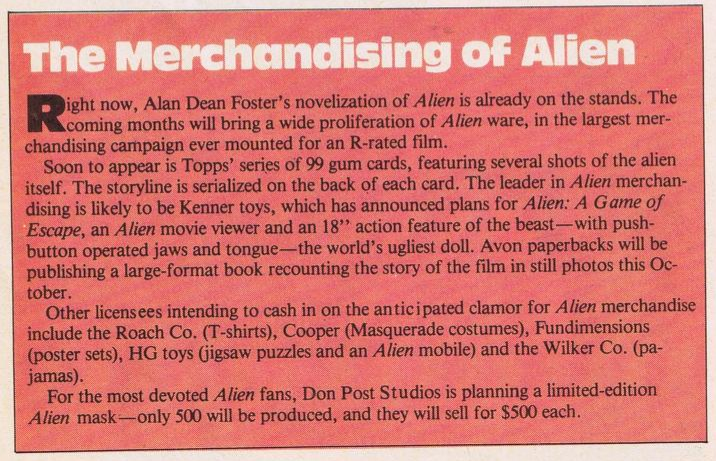 Remember the halcyon days before the internet, when magazines like Starlog and Cinefantastique held the monopoly on movie news, trivia, rumours and interviews? 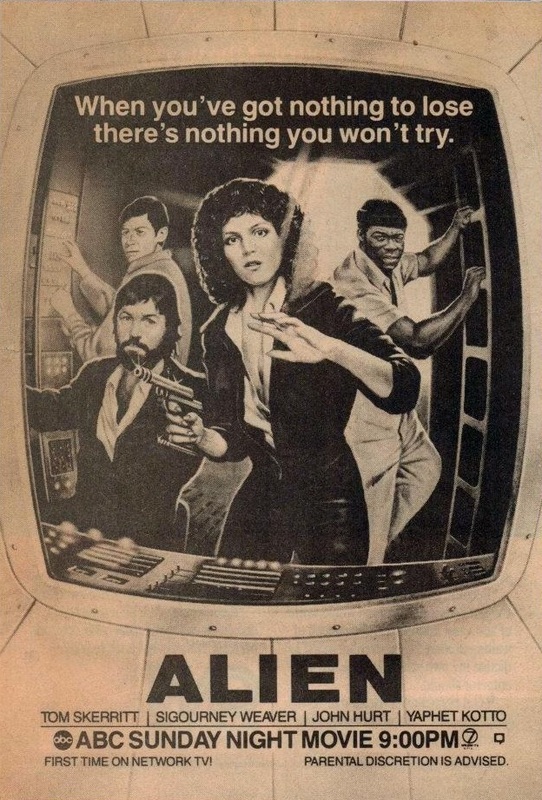 Well, I don’t quite recall, having been born in 1988, but I’m more than certain that leagues of Alien fans do remember, and quite fondly too. 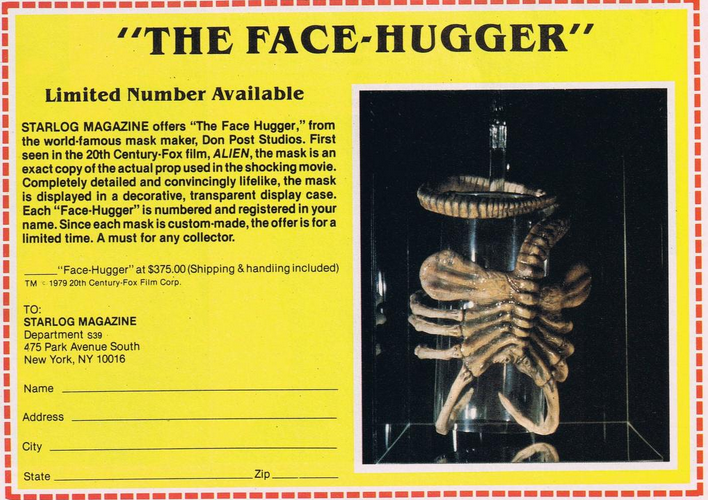 If you were looking for film collectibles and merchandise pre-eBay then the aforementioned magazines were a port of call. 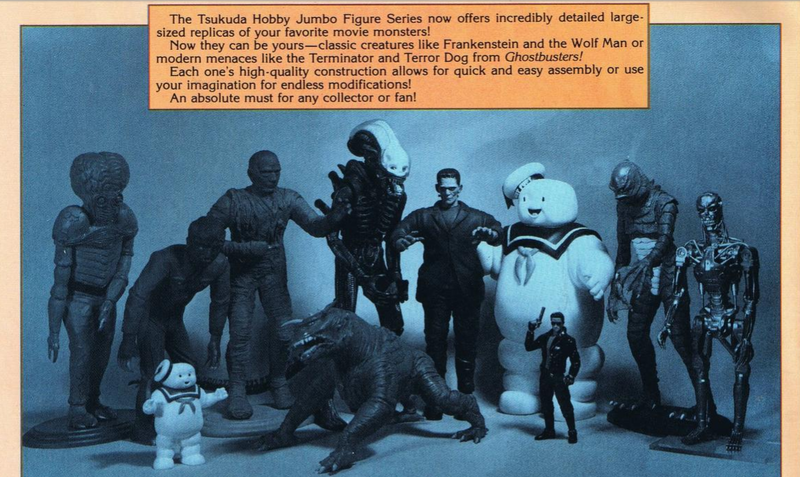 Advertisements offered everything from Ghostbusters jumpsuits, Star Trek model kits, movie posters, video tapes, soundtracks, novelisations and advertisements for film festivals and conventions. More caps (lovingly modelled by Brett), plus pins and badges with designs that you can glimpse in the film. 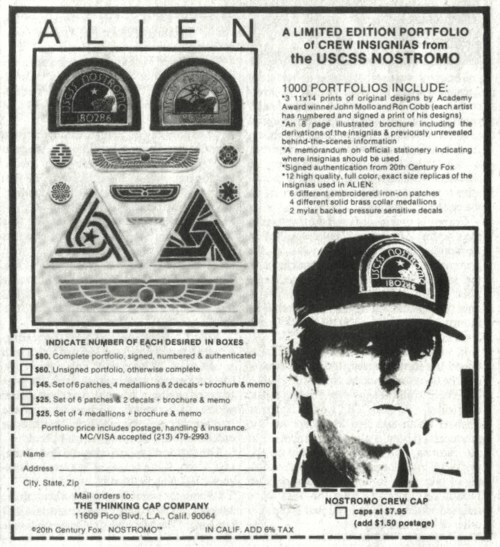 The badges were designed by Ron Cobb and John Mollo and you can read about what some of them represent in Dressing the Future. 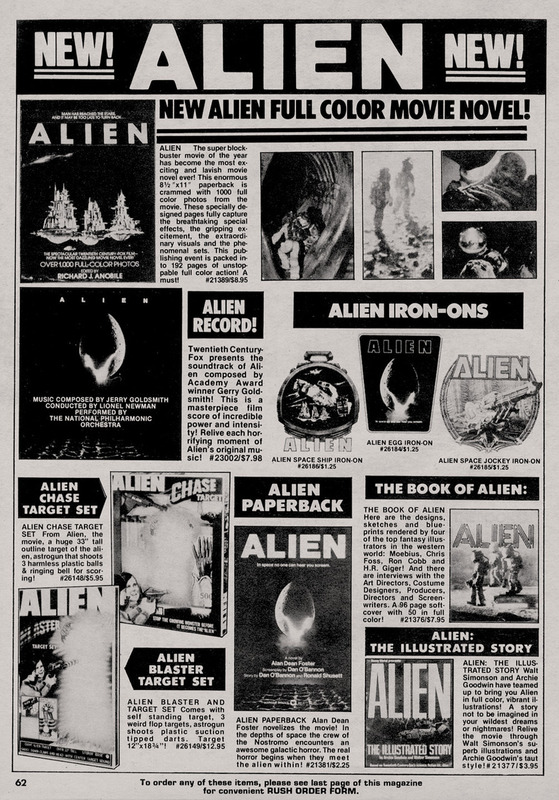 To my knowledge, zines were rather like a pre-Internet Internet — they allowed communities of fans to form around a certain subject (such as Star Trek or the Alien franchise) and grow, much like a pearl grows around a grain of sand. Cultures developed through zines. Speaking as someone who feels that technological capacity has far exceeded our creativity (which is why so many films and video games resort to fancy visuals instead of good writing, interesting ideas, and developed characters — the former is easy, the latter three are difficult [though there is evidence suggesting that crowd-funded/freemium video games and subscription TV like HBO are the new Mecca for media creativity]), I kinda wish things would slow down a bit: zines, dial-up speed Internet, and 16-bit graphics — not for the nostalgia value (I’ve played some truly awful 16-bit games), but because true creativity is often forced to assert itself under limited constraints. Currently, we circumvent the need for creativity by throwing hardware at the problem. Not smart enough to develop a more efficient rendering algorithm? Just wait for consoles to become more powerful, then brute-force good graphics, and to hell with all the rest! Putting limits on ourselves forces us to be creative. I wish we had more limits. Hence, I enjoy zines, because zines represented a creative solution to the problem of fringe demographics. Basically: the less popular something is, the fewer people like it, therefore the number of people who like it in a given area who like something diminishes. To compensate, you need to either assemble everyone who likes it in one place to form a community, or you need some way to form a distributed community. Before the Internet, zines allowed people to form distributed communities. I miss those days. No, I don’t. To recapture the magic of Alien, all I need to do is remember the first time I heard the mournful wind on LV-426, the first time I heard those solitary notes of the soundtrack, the first time my heart skipped a beat when I realized what was about to happen to Kane. Granted: I consume knowledge, and therefore have a taste for errata. But acquiring these things is a means, not an end. This is not to criticize those for whom consumption is an end; it takes all kinds to make a world. I’m just not wired for it. 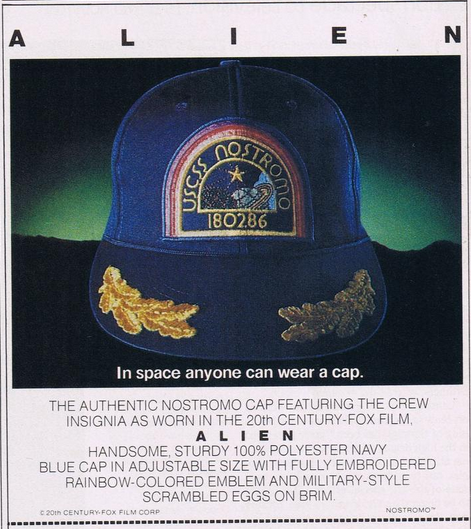 My dad bought me the Nostromo Baseball cap, I wore it everywhere. Then a cousin stole it. Grrr.